Home » Fishing Reports » Backcountry Fishing » Backcountry Bite Is On! October 2 2015 – Its a windy day today here in Key West. Winds are out of the NNW cold front style and the first feeling of fall is upon us. The winds are scheduled to drop out by Sunday The 4th and the bite is on. A great time to visit Key West as the rates are low and the crowds are thin. 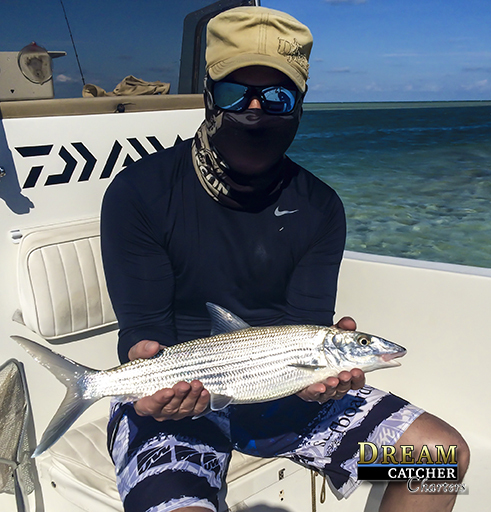 The backcountry fishing has been very good these last few days here in Key West and our anglers at Dream Catcher Charters have been getting some nice shots at many different species of fish. Truth is, October is our favorite month to fish the backcountry waters off of Key West. On the flats fishing front we are showing up with some nice catches of bonefish that are numerous and decent size. Ranging from 3-6 lbs these fish are known for blistering runs and fun hard pulls. Our bonefishing will slow down considerably by the end of the month, get your shots at them NOW…. The permit on the flats in October is like the Pope in the Vatican, they live there. Tailing fish are teasing our anglers to spend some time in pursuit of these fantastic sport fish. Permit fishing will be good all the way through December. Other than the flats fishing species we also have a plethora of other fish to shoot for here in the Key West backcountry waters. Jacks are best for the hardest pulling and unpredictable fight. Some trout are showing up in the deeper waters with the mix of tarpon, pompano and lady fish milling around the edges and on the muds. Shark fishing is very good in October as the sharks don’t get chased off the flats by the heat. This is a great time of the year to hook up on a nice sized bull or lemon shark. Check out our signature Shallow Water Monsters shark fishing trip to see more about how we can hook you up on a nice shark.